A genuine British Osprey combat vest. Here's a good package deal with some useful pouches. Used. Note: the body armour seen in the pictures is not included. Note 2: the above list is an example of what you might get. The composition of the pouches might vary a bit. Hey, a genuine Osprey set for this price is a solid deal if you ask us! The British Osprey system is similar to the US MOLLE system and Interceptor body armour. 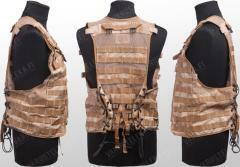 The vest is meant to be worn over body armor and equipped with the pouches you need where you need them. The vest itself has two smaller and two larger hidden pockets. The large pocket on the right fits a pistol and two magazines. The back has a small pocket for a map or wallet. On the outside you'll find quick release buckles for a PLCE rucksack side pouch or compatible hydration carriers. All pouches and the vest itself feature the Desert DPM camo pattern and NIR protection as usual with modern war stuff. 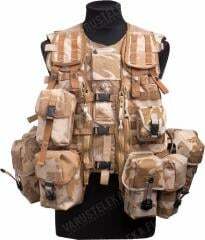 Osprey vests have been in use in Iraq and Afghanistan by all branches of British armed forces. The vest is designed to be worn over body armour, but it doesn't have to be specifically the Osprey body armour. Without body armour you should have a lot of clothes or weight, because even when adjusted all the way down the circumference around the torso is about 100 cm. The sides are adjusted with weaved drawcords and the length is adjusted at the shoulders. The adjustments were made with bigger fellows in mind. The pouch attachment is very similar to the PALS webbing found on MOLLE gear. The measurements are slightly different, but generally any Osprey stuff goes together with MOLLE either way. The vest is covered with webbing so you have a lot of room for creative solutions. Used, and in perfectly serviceable condition. The vest in the picture is unissued, so expect a somewhat more faded vest. Todella mukava liivipohja ja loistava määrä taskuja mukana. Laatu perinteistä brittiä eli ei ole vielä vuodenkaan jälkeen hajonnut mistään kohtaa. Ei ehkä suomeen sopivin väri/ maastokuvio mutta se korjaantui helposti parilla maastospray -purkilla. Excellent value. The vest I received came with 13 Molle pouches: Utility x 3, small utility x 1, medical x 1, grenade x 2, 40 mm grenade x 2, SA80 ammo x 2, water x 1, torch x 1; as stated in the description, this will vary. The vest and the pouches were in great shape. I am over 6 feet tall and over 200 pounds, and the vest fits me well; it is adjustable smaller and larger. The 40 mm grenade pouches are the smallest; I made one into a fire starter kit (ferro rod, cotton balls, esbit tabs). A standard 1 quart US canteen does fit in the water pouch. I plan to order more. Oikein näppärä paketti hyvään hintaan. Liivipohja saapui minulle täysin pränikkänä ja taskut olivat vain hieman käytettyjä. Taskuja tuli enemmän kuin luvattiin; 2x lipastasku, 2x yleistasku, pieni yleistasku, 2x heitetasku, 2x 40mm tasku, lääkintätasku ja snickers-tasku. Osprey systeemi on täysin yhteenkäypä mollen kanssa, ja näin ostinkin erillisen lipastaskun (joka kannattaa hommata mikäli pyssysi syö ak:n lippaita) sekä pari muuta. Ainoa huonompi homma on tuo väri mutta senhän saa itse korjattua, paitsi jos pelkää että joku hyökkää strömsöstä. Enpä itse ainakaan ole mistään muualta löytänyt yhtä hyvää settiä samaan hintaan. Received the vest today and I couldn't be happier. Not only is the vest well made and sturdy, it came with 13 pouches. Sweet fancy nut sampler, I'm as happy as a school girl who just got a new pony. This vest is a great deal for anyone who needs to carry a lot of supplies and still have your hands free. The quallity of the vest and pouches is just outstanding! Got the same 13 pouch layout as Ron B. and both the vest and pouches i got seem to be unissued. For this amount of money, it's not a bargain, it's a steal! Excellent stuff for an excellent price. Actually, insane price with regards to what was delivered. Top notch quality and mine looked almost brand new. Will blend in nicely in autumn colours. For the price, this is a crazy deal. My stuff came in what looks like factory plastic - if the kit ever was issued, it's was to some R.E.M.F. who never even got it dirty. Obviously luck of the draw there, but I also got even more than what was promised as far as pouches; 2x mag pouches, 3x large utility pouches, 2x AP grenade pouches, 2x 40mm grenade pouches, a med pouch, a small utility pouch, a water bottle pouch, and a "knife/torch" utility pouch. Honestly better than I had hoped for even with the great reviews.